Michael Kenneth Williams as Jackson and Emilio Estevez as Stuart Goodson in Universal Pictures Content Group's drama "The Public." 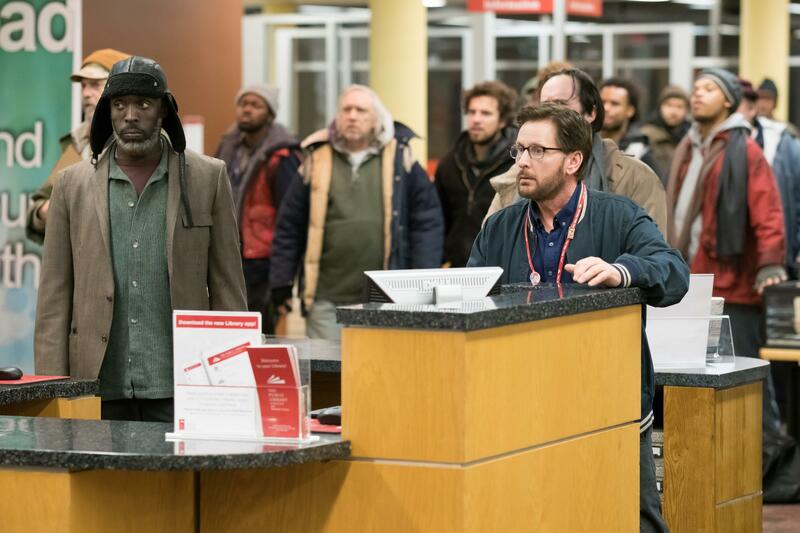 A new film written and directed by Emilio Estevez explores the complicated relationship between libraries and the homeless community. "The Public" centers around the Cincinnati Public Library as the city experiences a bitter arctic chill. WLRN's Luis Hernandez speaks with Emilio Estevez, star, director and writer of the film "The Public." He's also joined by Ray Baker with Miami Dade Public Libraries. WLRN: I've got Google. I've got Netflix. I've got everything I want at home. How do Americans view their library today and why do we still think libraries are important? Estevez: Well first of all, librarians were the first Google. And I think we have to remember that sacred space, where a patron approaches the desk reference librarian and asks a question. Guess what happens there? They get the questions answered and the libraries are where facts live. And while they're getting that service, they are not getting bombarded with ads. They're not getting bombarded with spam. So recently Forbes posted an article online and it said, "Why do we need libraries when there's Google and Amazon." Well they were forced to take it down after two days because of the outrage by public librarians, who said this guy is full of it and and they shouted him down. So librarians are known mostly for being quiet. We're not quiet on this subject. What's the conversation like in the libraries with the staff about treating the homeless? You have said you want to treat everybody the same but at the same time this is a unique group. They don't want to go home. How are you supposed to treat the homeless and help them with their issues? Baker: Well I hate to keep going back to the idea of treating them all like you would treat anyone else because they do have different needs than everybody else. We try to encourage our library and staff to help them out with getting them down a path where they're getting help with identification cards, getting access to websites where they can get help with social security, helping them try to get in contact with relatives who might be able to help them get out of their current station in life. Emilio, a number of the homeless depicted in the movie are struggling with mental illness and substance abuse. It's estimated between 25-30 percent of homeless in the United States are dealing with mental health issues. I'm curious about the research going into the film. What were some of the things that you found that surprised you? Baker: Yeah we're trying to work on a program with them to get the students who are getting social work degrees, the master's degrees, to develop a program where they can come into the libraries and try to provide social work, and work with some of our patrons that are in the library. Estevez: And this is a system that started in San Francisco and it's been a very successful program. And it's really taken the burden off of the desk reference librarians to deal with a lot of the issues that these individuals are experiencing. Ryan Dowd has been traveling with us, he wrote a book called, "The Librarian's Guide to Homelessness." And so he's been traveling not only with me, but before he and I met he was traveling around the country. The book had just been published and he offers training specifically to librarians, about how to deal with people experiencing homelessness and mental illness with an empathetic approach. And so, he's been very helpful along this 35 city tour that we've been doing on the film. National Library Week is April 7-13, and WLRN wants to hear from our listeners about their local library. Tells us why you love the library or share your favorite library story. Text the word 'library' to 786-786-7826. Standard messaging rates apply. And by the way, did you know WLRN Sundial has a book club? Find the details here.